It's a common misconception that heroes are heroic just because they're innately predisposed to be that way. Svoboda shows why it's not simply a matter of biological hardwiring and how anyone can be a hero if they're committed to developing their heroic potential. Elizabeth Svoboda has contributed to "Fast Company, Popular Science, Psychology Today, Discover, Salon," and "The New York Times," among others. In 2008, she received the Evert Clark/Seth Payne Award. She lives in San Jose. What Makes a Hero? is really about how to become a better person—a subject science has more to say about than you might expect. The world would be a better place if everyone read Elizabeth Svoboda's fun, fascinating, and deeply researched book. In this readable and engaging volume, Elizabeth Svoboda weaves research, public narratives and personal stories together to demonstrate the counter-intuitive truth of her title: that heroic action can be learned; that heroic inclinations can be nurtured; and that “heroes” can, in fact, be made. We all have it in us, and through rehearsal, practice, self-insight and peer support, we can bring our inner heroes to light. It's a joy to join the journey of Elizabeth Svoboda, a young writer and researcher, as she brings together personal stories and exciting studies to explain what pushes us to aid others—from daily helping to headlined heroic acts. In these trying times involving global political conflict and economic hardship, Elizabeth Svoboda gives us all hope that science can show humanity the right path. Her book artfully describes the psychological and physiological explanations behind altruism and heroism—which just might crack the toughest cynic. But must importantly, she gives us a glimpse into how we all hold it within ourselves to make our immediate communities a little bit better. Kudos to Elizabeth Svoboda for answering the question What Makes a Hero? She examines every facet that contributes to heroic behavior: genes, neurobiology, thoughts and feelings, social forces. She even does her own “experiments” in heroism and shares her results. A must-read for anyone curious about real-life heroism. —Robin Rosenberg, Ph.D., psychologist and author, Superhero Origins: What Makes Superheroes Tick and Why We Care; editor, What Is a Superhero? 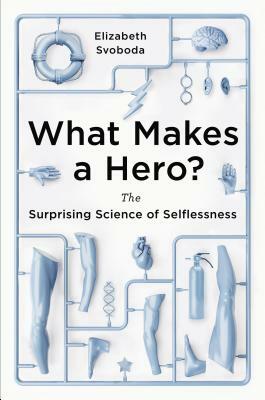 Elizabeth Svoboda's engaging new book explores what makes a hero—and reveals science behind the greatness and generosity possible to any human being.